I injured my shoulder in 2014 and that came back in August. I couldn’t use one arm for a while, I had to slow down for a few months. It was some sort of tendon issue, perhaps something RSI-ish this time, probably from playing Hearthstone too much. I still don’t know what exactly, because the NHS website said not to see a doctor and that they probably couldn’t help anyway. It seems to have mostly cleared up, but it’s still healing. I’m over 30 now, so I’m ineligible for certain awards and my inventory is degrading. There were a few games last year that left a lasting impression on me. INVISIBLE, INC. took me over. It’s an incredibly solid game, with plenty of well-knit systems that support greater and greater depth without getting fiddly and a very boardgame attitude to resources; lots of small explicit numbers and clear rules. My touchstone for squad tactics for years has been XCOM, which informed CQ2’s inventory design. Right now it’s this. I played DEADLY PREMONITION in 2010 and hated it. It’s clunky. It doesn’t make sense. The controls are deliberately awkward. It dwells on the inane. I played it again this year—a little more patient and hopefully a little more literate—and I fell in love. I love the instant characters, I love the soundtrack, I love the driving model that lets you indicate for turns but can rarely make it round them. After hearing about Mizzurna Falls, I love that Japanese games based on Twin Peaks is practically a genre. 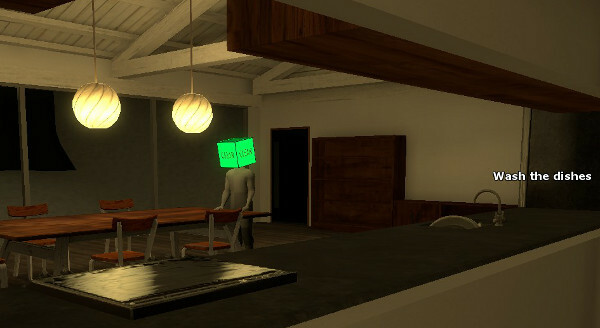 THE BEGINNER’S GUIDE is, I think, a game that posits a future in which it’s unremarkable. That’s why it’s interesting; I want to see that future, the one in which interpreting a game and disentangling its fiction are ordinary aspects of play. I don’t think TBG is that future but I reckon that, as the title suggests, it may be a map. I’m at a loose end! It’s nice. I’ll do a few CQ2 updates when I feel like it. I have an album I want to finish and some new musical stuff I want to explore. I have a boardgame I want to put together, a two-player game of space fleet battles. I might be setting up a Kickstarter for that this year. Beyond that, I’ve got to figure out what kind of games I’ll make next. 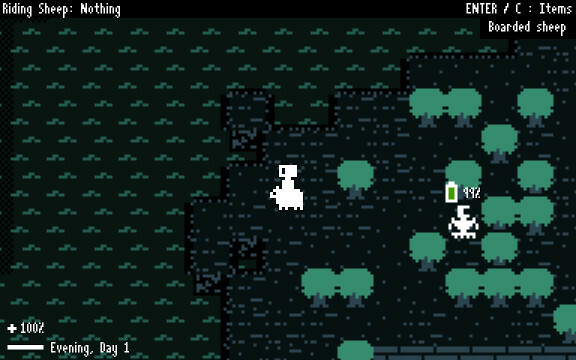 Right now I’m working with Terry Cavanagh on a project of his, a game about survival and programming robots to do it for you. Sir, it’s been a pleasure to follow Cardinal Quest II’s development and watch the game grow from the foundation of CQ1 into what it is today. I’ve logged more hours in the game than I can count, across multiple platforms and versions, digging into the classes, piecing together the fragments of the story, and recording my explorations on the wiki. I’ve really enjoyed reading your dissections and explanations of the gameplay, mechanics, and design decisions of various games and how they inspired and influenced CQ2 on this blog. Your writing has been similarly instructive and inspirational to me. Thank you, both for a great game and for recording the experience of making it. I found this place because of CQ2 (and it’s somewhat bittersweet to see it completed) but I’ll stick around to see where things go next. its so weird to see a game be announced completed when you dont realise it and expect more, like with nuclear throne even in update 90 i didnt know they were finishing up and expected more. i still hope for occasional updates though. Awesomesause175: I’ll do more updates. The game being “finished” is the end of the boring stuff like making sure it works on all the different platforms and stands up as a game, start to finish. The fun stuff can continue—and updates with new content are most definitely fun! I literally don’t remember how I found CQ2 back in 2012 but the beta had me excited so I left it only until the 3 days after haste got removed. At first I thought “dam this combat style is so simple, I’ll get bored soon with the other classes” but then I just couldn’t stop playing, updating the wiki, learning new things from the updates. When the mobile update came, I thought it would be “great” but after going home on a 2 hour train-bus ride, this game made me relax, think, and even get better at problem solving. It’s because of you mister that I chose my degree in networking (other choice was culinary lol) that I will be finishing this august. If you need anything from us then we’ll always be around. Even the Kong community has high regards for you. And the wiki is pretty much almost complete and highly studied. I only just recently beat acts 1 and 2 and noticed something that irked me. Been playing a while and mostly played the tower after unlocking it. When the new update finally came to my android phone I gave act 1 a go again and beat it. When I was done, the game went back to the main menu. I thought I must have hit the wrong button. Last night I started at and beat act two and am certain I hit continue. It went back to the main menu again. I assumed that if I finished an act, that my character would continue to go onto the next act. Is this not how the game is intended to work? Can you only play a single act at a time and have to start over with a new character to do a new act? Or am I doing something wrong? It would be nice to take a single character completely through all 3 acts. Will there be updates for CQ2 anytime soon? Latest patch introduced a bug that makes item creation with alchemist much less useful. See steam forum bugs thread for details. Thanks for this amazing RL, and thanks for the updates and being so good on feedback. I’ve been really digging the playstyle of the “gunslinger” alchemist, but I feel like a good run is super duper dependant on getting items and skills that boost speed. Normally, when focusing on using the pistol I take weapons that prioritize speed because its increases your evasion and reload time. Without being able to hold a weapon the alchemist is often either – 2 or – 3 behind another alchemist who gets a decent dagger or twin blade katana. I also feel like precision is irrelevant because the pistol never misses. I wonder if it would be possible to swap precision for celerity when playing the gunner? or a least have him start with +2 base speed to compensate for the speed a dagger normally grants you? Swapping the talent seems liked the most balanced option, but any sort of boost would help this very interesting subclass more on par with his weapon swinging counterpart. Random, can you solve this problem? At the fighters base speed he will never be able to catch up with any ranged opponent ever any is only solved with ranged attacks like charge or fireball, however in order to get hardening, a really good talent, you cant take charge. So the problem is how to reliably deal with ranged enemies and be able to take hardening. Berserk, Glide, Teleport, Haste and Freeze all close the speed gap so that a fighter can get into close range. Fear/sleep/weaken can prevent the ranged unit from attacking you until you corral it into a corner. Magic Mirror is harder to use, but if you can place your mirror directly behind the ranged unit, it will a often times allow you to close the gap. Using bushes, corners, and doorways to your advantage to block line of sight can help you escape ranged enemies. I generally just try to avoid engaging ranged units in combat in open areas if possible. Sometimes you just have to chase them into a corner. I find blinding powder stupidly overpowered unless I have to do close combat and my health is at the point where I can die in 2~ hits from the game’s cruel randomness. After watching gameplay from a new game called Duelyst, it would be cool if you made a small pvp game based off this game as in a “Cardinal Quest Arena”. Turn based, a small map that can be 16×16 with terrain, I would love it but of course balancing stuff out would be annoying. It was a daydream ._. Kris: Thank you! And thanks for all your work on the wiki, I’m really proud of the community that’s built up around this game and fishing out all its little secrets 🙂 I love that you’re learning about networking, keep it up! Legend: That’s correct, right now characters get what they want and retire after each Act, so the whole campaign’s finished by a team. A continuous campaign through all three Acts is a fun idea but would take a lot of rebalancing; I’ve been putting that effort into the Tower instead. qqqbbb: I’m planning an update soon to fix issues and add a few things, yep – probably this month. Thank you for the bug reports, they’re very helpful! I’ll go in and fix what I can. Wyatt: That’s fair, Gunslinger as the only 100% ranged class is totally dependent on Speed stats and you’re right, they don’t have any use for Precision. I think I’d rather make up for that with firepower than a speed buff though, since a ranged character that can outrun enemies easily gets boring. I’ll look at replacing the Precision talent in this build with something useful! Awesomesause: Every class needs a nemesis – a certain type of enemy that’s really difficult to handle. The Fighter definitely has the hardest time with fast, ranged enemies and yes, I added Charge as a fun way to tackle that nemesis! Perhaps I need to improve Charge to better compensate for losing Hardening. Charge builds should definitely be viable, but they do need a downside. Kris: That’s interesting! Blinding Powder is definitely better for ranged characters, where in 1 on 1 fights it’s practically an invincibility potion; but maybe it lasts just a little too long. Then precision would have some use, or a skill could be something like “headshot” that would double critical hits. Buffs a gunslingers power while making his attack stat actually mean something. The first is really minor and doesnt affect gameplay, sometimes there are blue dots over chasms and i dont like it. The second is that sometimes equipment drops from chests or enemies varies in transparency and sometimes is invisible. These are interesting issues – I’ll have a look. Awesomesause175: any chance you could show me a screenshot of the blue dots or transparency? I’m at a bit of a loss!